Photograph taken on board the clipper ship Electric Spark at the Chincha Islands. 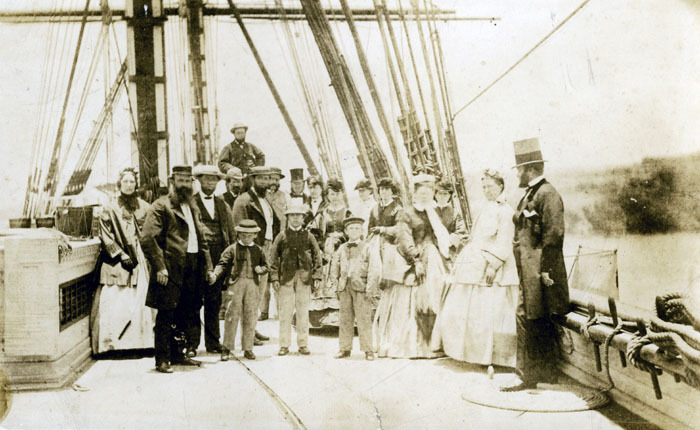 In this group are four Searsport ship masters with their wives and children: John Pendleton, William Blanchard, Albert Nickels, and Nathan Carver, whose ships were at the Chincha Islands at the time. All of these vessels would have been waiting to load guano, a wait that sometimes took weeks. The 1190 ton Electric Spark was built in Medford, Massachusetts in 1855. Her master, Medford's R.F. D. Candage is second from the left. 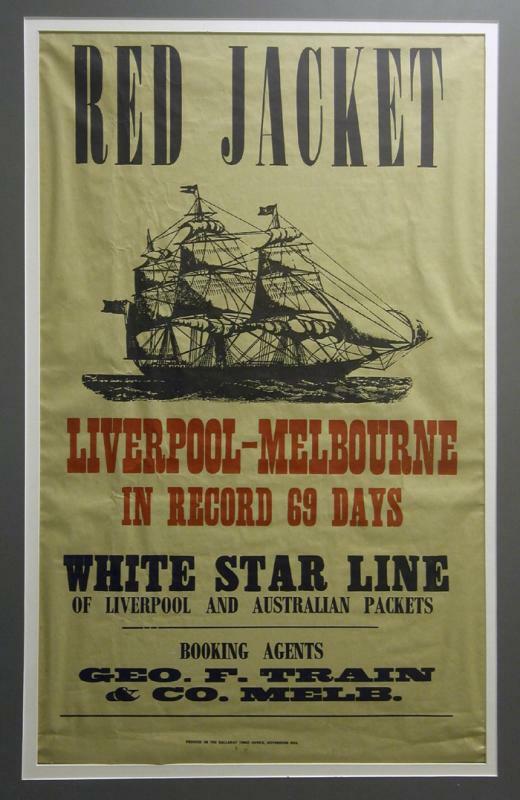 Poster advertising the clipper ship Red Jacket, reporting its fast voyage from Liverpool to Melbourne, Australia in a record 69 days. 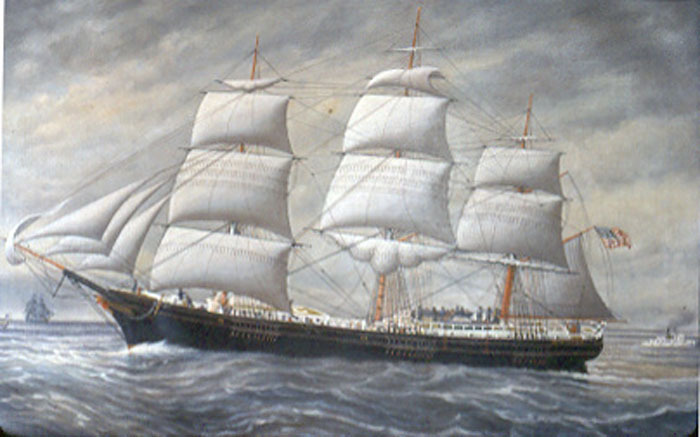 Red Jacket was built in Rockland, Maine in 1853, and after her first voyage, a record breaking passage to Liverpool in January 1854, was sold in April to Pilkington & Wilson of Liverpool. They managed her as part of the White Star Line. The White Star Line operated the chief passenger service to Australia and later became one of the main transatlantic lines, the owners of the ill-fated Titanic. Gus Skoog, the Vinalhaven boat builder, also built models. 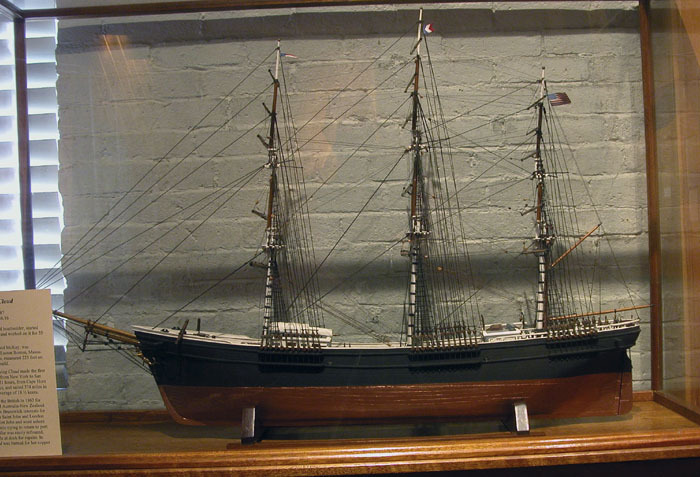 Here is his model of the famous Donald McKay-built clipper ship Flying Cloud, a common subject for model builders.